The number of changes in Apple’s radical iOS 7 update for the iPhone, iPad, and iPod Touch is pretty overwhelming (which is why I don’t recommend installing the update until you’ve checked out the all-new iOS interface), but there’s a specific new wrinkle in the iOS Mail app that I found particularly vexing. 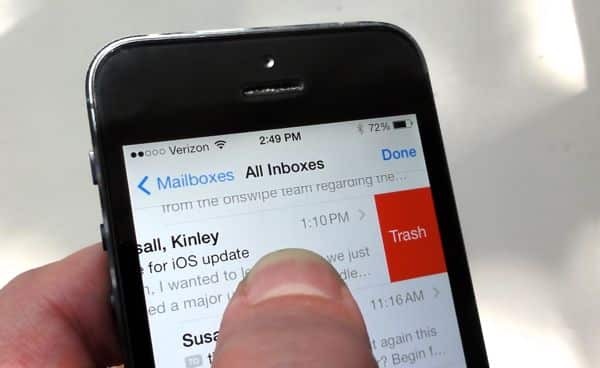 Namely, the old swipe-to-delete gesture for an individual email didn’t seem to be working anymore—and no matter how hard I looked, I couldn’t find a new “swipe to delete” setting to enable. Swipe right to left to reveal the Archive/Trash button, or tap More to reply, forward, flag, and (natch) more. Well, get this: turns out you can still swipe to delete an email in iOS 7. OK, so what was I doing wrong? Simple: instead of swiping left to right as we’ve always done on an iPhone or iPad, you need to swipe right to left instead. Doing so reveals a pair of new buttons: “More” and “Delete” (or “Archive,” if you’re using a Gmail account). Note: Yes, you can also swipe right to left to delete an email in iOS 6, but I’d never actually tried to do so until now—and I only did so while researching this tip. Maybe it’s a right-handed brain thing. Still have questions? Running into other iOS 7 problems? Let me know, or send me an email.